Hello and welcome to www.racetothecard.com. As a newly retired baby-boomer, I’ve always been fascinated by political movements such as the one for civil rights and the ongoing struggle for equality. I’ve met and befriended people from all walks of life and have come to realize more deeply than ever that we are all at root the same, with only some trivial differences in how we express ourselves and how we appear. Yet, there is still the obvious schism that exists between people due to race and skin color. Recently I had an “aha” experience related to this truth. I was surprised to learn that the color of one’s skin, no matter race, creed or color, is universally governed by genetic predisposition, and by commonly shared biological processes that take place in roughly the top 1/8” of the skin! This blew me away as I then realized the absurdity of negating the “whole” of another simply because of a two-dimensional fixation on a tiny fraction of a person. Although no more than what amounts to a physiological surface veneer, skin color is assumed to mean so much more. I’ve introduced “The Race Card” to provide a simple and effective way to demonstrate this truth, and invite you to play it by reading the card’s unique message and then experience the true depth of prejudice firsthand. 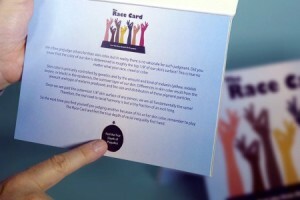 In addition to its unique message, The Race Card contains a circular recessed strikeout similar in depth to where skin color is actually determined, so your finger feels what amounts to be the true depth of racial discord, or the gap that separate us from each other. 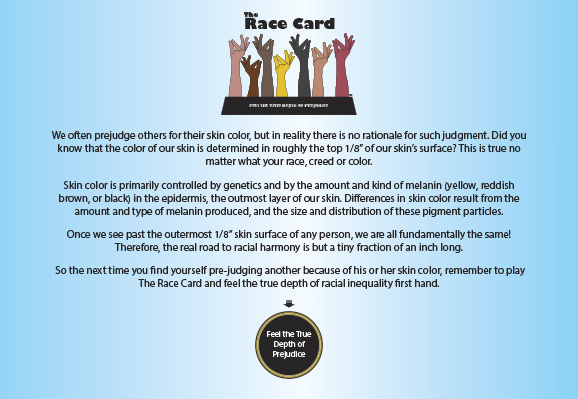 The Race Card teaches us that at root we’re all alike and the real road to racial harmony is a tiny fraction of an inch long. 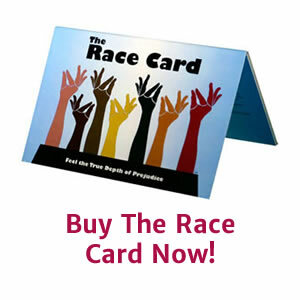 It’s my hope that you buy The Race Card for yourself and perhaps purchase additional cards for family, friends, business associates, colleagues and others. It serves as a unique educational tool whose aim is to foster love and harmony throughout our nation and the world at large. A new and exciting perspective on race-relations is now at hand! 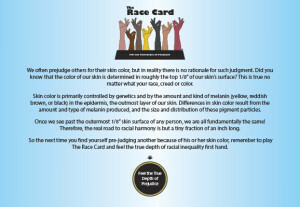 © 2019 The Race Card. All Rights Reserved.